Prof Ali Mokdad, of the IHME, said no country was beating obesity as it was a relatively new problem. "It takes a little bit of time to see success stories," he said. The study reported more obese women than men living in developing countries. Rates tended to be higher for women in developing countries as they were multi-tasking, looking after the family and working, said Prof Mokdad, so did not have the time to dedicate to managing their weight. 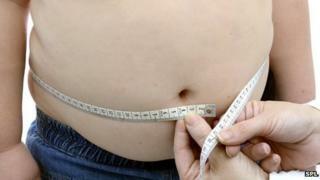 But more obese men than women lived in developed countries, said the study. Prof Mokdad said rates were higher for men in developed countries because of longer commutes to work, fuelled by a move to the suburbs, and spending more time inactive, using computers, he said. Prof Hermann Toplak, at the University of Graz, in Austria, said: "Over the past decades the modernisation of our world, with all the technology around us, has led to physical inactivity on all levels." Inactivity caused self-control to spiral, he said. Children and adults were not building up enough functioning muscle mass, and "classical eating" had been replaced by "uncontrolled food intake" spread over the day. he said. Prof John Newton, chief knowledge officer at Public Health England, said poor nutrition and lack of exercise were a big risk factor in Britain's most deprived areas. PHE ran campaigns to help families be healthy, more active, and cut down on fat and sugar, he said. He added: "Obesity is a complex issue that requires action at national, local, family and individual level; everyone has a role to play in improving the health and well-being of the public, and children in particular."